Fourth Row Center: Film Writings by Jason Bailey: New on Blu: "Heartbreak Ridge"
For those of us who are Clint Eastwood fans, it’s easy to let the overwhelming quality (and astonishing frequency) of his recent output cast a rose-colored glow over the entirety of his filmography. But for all of the tremendous pictures on his directorial resume—and there are plenty of them—there are some real stinkers (True Crime, The Rookie, Firefox). 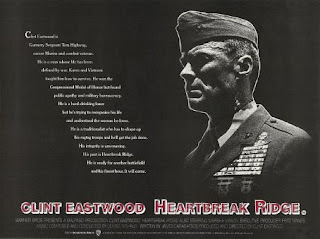 Add to that list 1986’s Heartbreak Ridge, a goofy, badly aged compendium of hoary war movie clichés given little life or spirit by the skilled actor/director. Eastwood stars as Gunnery Sergeant Thomas Highway, a hard-drinking, hard-living Marine creeping up on mandatory retirement. Hoping for a change of pace and maybe (though he’d never admit it) a new start, he gets a transfer back to his old unit, where his new major (Everett McGill) puts Highway, who he sees as a “relic,” in charge of an ostensibly untrainable reconnaissance platoon. He’s also got his eye on winning back his ex-wife (Marsha Mason), who now works as a cocktail waitress for a Marine-bashing jackass (Bo Svenson) who is, of course, also her new boyfriend. Any wild guesses as to how things turn out for “Gunny Highway”? That maybe, just maybe, after some resistance, he manages to whip that band of stray Marines into fighting shape, using his own unconventional but effective methods? And that maybe he wins back that pretty ex-wife of his, thanks to his grizzled charm and willingness to change, ever so little, for her? Is the sky blue? The Clint-against-the-world construction of James Carabastsos’s screenplay is too damned neat for us to take the conflicts seriously; it hits those marks is such an obvious fashion as to be nearly comic (one halfway expects him to also have a dog that bites him and a car that keeps breaking down). Ditto the platoon-that-couldn’t-shoot-straight quality of his men—they’re painted as such a ragtag group of misfits that the film loses its grounding in reality (no matter what a schmuck their previous sergeant may have been, are we really supposed to believe they’d have been allowed on the base with earrings and long hair?). Carabastsos also has trouble carrying his subplots through; there’s a big scene where the lumpy new major informs Highway that he’s gonna bring him down, tells him exactly how he’s gonna do it, and then doesn’t. The movie promptly forgets about his threats, save for one half-hearted bit with a subordinate trying to get Highway’s men (who are by now squarely on his team, of course) to give statements about those dern crazy methods of his. And then there’s Mario Van Peebles, who co-stars as Corporal “Stitch” Jones, the jive-talkin’ jokester and wannabe rock star of the unit. Van Peebles has done some good work, but not here—it’s a terrible performance, though damn near any actor would sink with this film’s dated dialogue (“Word, am I fresh?”) and fanciful notions of hip music for the young people. The out-of-nowhere “rapping” and rockabilly singalongs in the barracks are bad enough, but when we see Stitch’s big number at the local dive bar, we can’t help but notice that we’re hearing his vocals loud and clear in spite of the fact that he’s not singing into a microphone. That’s a rookie director’s mistake, and as a viewer, you’re not sure where Clint’s head was at when he made it. But what’s more befuddling is the film’s overall willingness to recycle the most overdone tropes of the war picture; he’s not even breathing new life into them, as he did with Pale Rider, his sturdy Western yarn of the previous year. In the opening credits, we see black and white documentary footage from the Korean war (where Eastwood’s character fought in the title battle), accompanied by military drums. But then, in a wincingly effective switch, the music changes to the rollicking country number “Sea of Heartbreak,” and we see images of the casualties of that war. It appears, at first, that Eastwood is setting out to futz with our war movie iconography, but there’s nothing that daring or subversive in the film itself, which slides through its training and battle scenes (the unit is activated for the invasion of Grenada) with about as much subtlety and nuance as Wayne’s The Green Berets. What works in the movie is mostly what’s happening on the edges; Eastwood’s byplay with a friendly old barmaid (nicely played by Eileen Heckart) is entertaining, and the character arc of bookish Lieutenant Ring (Boyd Gaines) plays, thuddingly obvious though it may be. Mason is pretty good as well, bringing some spark to her scenes, though this dialogue is a long way from Neil Simon. The climactic Grenada sequence is well-executed, but pretty much rote—we don’t have much in the way of emotional investment, and certainly no doubt as to how it’s gonna turn out. Unsurprisingly, Eastwood’s quiet authority and unforced intensity as an actor holds the film together as well as it can—and Carabastsos does script him a few memorable lines (“Why don’t you just sit there and bleed a while before you taste some real pain.” “With all due respect sir, you’re beginning to bore the hell out of me”). Clint Eastwood is as fun to watch as ever, and as a fan, I’ll see just about anything he does. But with its all-too-predictable plot turns, strained dialogue, and stacked-deck storytelling, Heartbreak Ridge puts that personal rule to the test. "Heartbreak Ridge" is available now on DVD. It makes its Blu-ray debut on June 1st. For full A/V and bonus details, read this review on DVD Talk.